Indore, Oct 29 : Congress President Rahul Gandhi arrived here on Monday in poll-bound Madhya Pradesh. He took a special flight to Ujjain to launch his two-day campaign with a visit to a temple. Gandhi would be speaking at rallies in Ujjain and Indore on the first day and kick-off day-2, with a meeting of senior members of the press. He would visit Dhar, Khargosh and Mau before returning to the national capital. 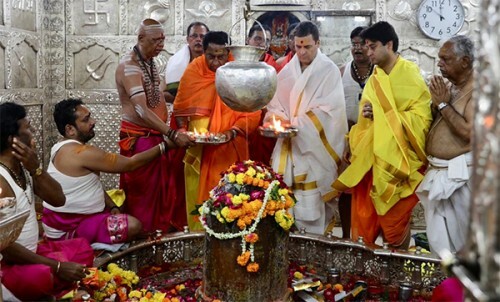 The Congress chief was received by state President Kamal Nath and poll in-charge Jyotiraditya Scindhia, who accompanied Gandhi to Ujjain, where they performed special pujas at the Mahakaleshwar temple. Gandhi was scheduled to address a rally in Ujjain's Dashahra Maidan. He will proceed to Jhabua town later to address a gathering at the college ground. There would be a roadshow in Indore around 5.45 p.m., police said and he would address people at the Rajwada Chowk. According to the Congress on Tuesday, Gandhi would hold discussion with editors, journalists and businessmen at the Indore Radisson Blue Hotel. Later he would head to Dhar and Khargosh before paying floral tribute at B.R. Ambedkar's statue around 4.50 p.m. in Mau where another gathering would wait to hear him. He would leave for Delhi from Indore around 7 p.m.